This bobble cable pattern begins with a wrong side row and is knitted in a multiple of 11 stitches. Row 1 (Wrong Side) and all WS Rows: Knit 2, purl 7, knit 2. Row 2 (Right side): Purl 2, slip 4 to dpn and hold in front, knit 3, then knit 4 from dpn, purl 2. Rows 4 - 6: Purl 2, knit 7, pur2. Rows 10 - 12: Purl 2, knit 7, purl 2. Row 16: Purl 2, knit 7, purl 2. Repeat rows 1-16 until you have reached your desired length. Row 2 (Right side): Purl 2, slip 3 stitches to dpn and hold in back, k4, then k3 from dpn, purl 2. - Knit 1, yarn over, knit 1, yarn over, knit 1) in same stitch, turn. 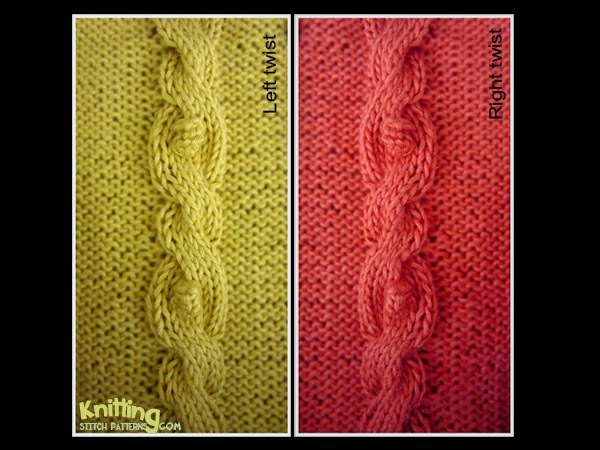 - Slip 1 as if to knit, knit 1, pass slipped stitch over, knit 1, knit 2 sts together, turn. - Purl 3 sts together.